After the customary pause for procrastination, a small set of photos from this year’s Glastonbury festival are now posted in the photo library. Another festival dominated by the weather, though some of our camp site neighbours seemed to revel in the drama of it all. 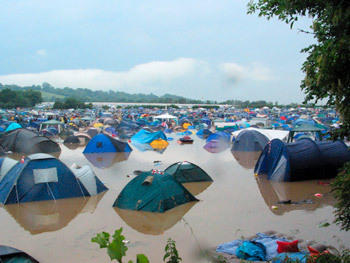 Before even leaving their tents on Friday morning of the great rain, they were on mobile phones: “they’re saying it’s the muddiest Glastonbury of all time… well, for fifty years at any rate!”. You almost expected to hear: “There’s a bloke up in Green Crafts, name of Noah, he’s building an ark and going to take us out two-by-two.” One nearby woman, we dubbed ‘local radio DJ’ for her breezy, smoother-than-smooth telephone patter, declared “well, it’s blue skies all the way from hereon”. It wasn’t, but things did improve enormously, to the extent we got sunburnt noses on Sunday. We also got to exercise the twenty-three different words for ‘mud’ known to all Glasto veterans, and in double-quick time. Friday was liquid, Saturday gloopy, then claggy, and Sunday delightfully doughy.